'The Fighter', the movie about boxer Irish Mickey Ward, has won the first two big Oscars of the night at the Academy Awards. Best supporting actress went to Melissa Leo while Christian Bale (pictured with Mark Wahlberg) won best supporting actor. 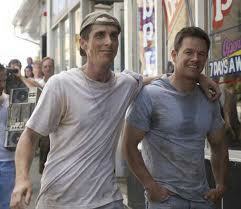 But so far the underdog is wining the battle at The Oscars just like Mickey Ward did so many times.